I have been lucky to work for some great consulting companies over the years who recognize the importance of their consultants actively participating in thought leadership and IT community activities. I was a technical trainer for a large part of my career and really enjoyed teaching. When I went into consulting it was great to practice what I had preached for so long but I began to miss being in front of a class. When .NET first appeared on the horizon, I along with several of my colleagues jumped on it and before long we were asked to start presenting what we had done at various technical organization in my area. 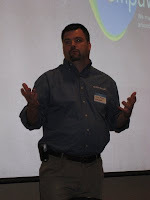 At my very first presentation an attendee later contacted my company to bring us in to help them with their .NET adoption. The value was immediately obvious. Attracting New Employees: I've often had people come up and ask me about working with some cool technology. I always make it a point to only present on technology I have actually worked with and I've been lucky to see a wide range of solutions. When other developers hear about the projects I have worked on they too get excited and interested in being involved. Advertising Your Solutions: Sometimes your company may have expertise in a certain technology and it is not widely known in your area. Presenting for multiple organizations helps get the word out that you have value to offer in a certain space. Positioning Yourself as an Expert: It is easy to look like an expert for 60 minutes when you have plenty of time up front to plan, but when you really know the material it is obvious to your attendees. This does well to market your own abilities and thereby your company's abilities. While there may be other people with the same skill set in a certain technology, effectively being able to communicate and explain it is just as valuable. Improving Employee's Communication Skills: Some developers are great at developing, but not so great at communicating. As a consultant, communication is a skill that is almost as valuable as your coding skills. Companies that encourage their employees to present are helping them grow these skills also. Differentiates You from Your Competitors: There may be many companies that offer the same services are you do, but being seen as a thought leader in a certain space can really set you apart from your competition. As you can see, there are some very real benefits to participating in IT communities as a Thought Leader. Companies who encourage the employees to pursue these activities and invest in them can see some very tangible gains. Even attending and supporting local IT groups can help with your business so get out there and be active! Thanks, Mack. It's good to know someone out there is getting something out of it!